Apart from defining single test-cases you can also specify the entire test scenario in Excel files or even within your test management tool. In our sample we will go on using Excel to keep things simple. Of course it's also possible to use your testmanagement tool there. For reasons of simplification we have used Excel files again. You can find a sample test-suite at qftest-4.5.2/demo/keywords/generic_with_scenario/ Keywords_With_Generics.qft. The scenario itself can be found in qftest-4.5.2/demo/keywords/generic_with_scenario/ scenario.xlsx. 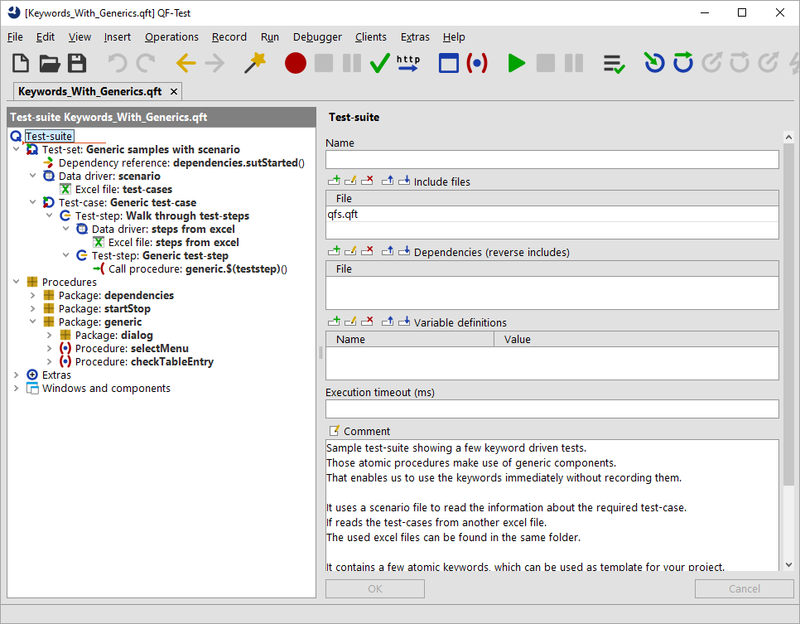 All used test-cases are described in a separate excel file, see qftest-4.5.2/demo/keywords/generic_with_scenario/ keywords-generic-testcases.xlsx. Please take care to copy the demo folder to a project-related folder first and modify them there. The provided scenario consists of two test-cases using the concept of generic procedures and components (see section 25.3). You can use any other approach, if you want. Let's take a look at the scenario Excel file. The worksheet "Scenario" contains a column "testcase". This value will be used as variable later. Each subsequent row represents a test-case name. Those test-cases correspond with the worksheets in keywords-generic-testcases.xlsx. The worksheets "tc_createvehicle" and "tc_createvehicle_cheap" contain the respective test-case description. How does the test-suite look like? Test-set "Generic samples with scenario" Represents the container node for the test-execution. This node could be omitted theoretically. Dependency reference dependencies.sutStarted The concept of dependencies allows QF-Test to manage the starting and stopping process of your application in an intelligent way. Dependencies can contain a strategy in case of any unexpected behavior during test-run. See section 38.3 for details. Data driver "scenario" Here we read the required test-cases to execute. Excel file "test-cases" Points to the scenario excel file. Test-case "Generic test-case" This node represents the implemented test-case. Teststep "Walk through test-steps" This node is required to read the test-steps from the excel file with a data-driver node. Data driver "steps from excel" A data-driver reads the content of the Excel file describing the test-case row by row. Excel file "steps from excel" Points to the Excel file describing the test-case. Test-step "Generic test-step" This node will be filled with the current test-step name from Excel during execution. This approach will create a readable report. Call procedure "generic.$(teststep)" Here the respective procedure defined in Excel is called. The variable teststep will be filled with the test data of Excel because of the data driver mechanism.